A special Thank You to Tribute Books for sending me this book to review. Convinced she’s a part of the witness protection program, sixteen-year-old Jewel Rose is shuffled around the globe with her family like a pack of traveling gypsies. After arriving at lucky home twenty-seven, she stumbles upon a mysterious boy with magical powers claiming to be her guardian . . . and warning of imminent danger. Despite the obvious sparks between them, Jewel discovers a relationship is forbidden, and the more she learns about dark, brooding Roman, she begins to question who she can even believe—the family who raised her, or the supposed sworn protector who claims they’ve been lying to her all along. First off, the cover is gorgeous! It is also perfect for the book. Right down to the color jade and that little butterfly. Everything is relevant to the story. It is so eye catching and beautiful. The model is...wow. I mean, this is just a great cover. Props to the designer. Isn't it stunning?! This is one of my top favorite covers of 2012. I was quickly swept up in this story. Its got a great beginning. It reads like a YA contemporary--which I love--while you're waiting for the paranormal aspect to kick in. I liked Jewel--for the most part--and I wanted to get to know her better. I like that this is a witch story. It's been awhile since there has been anything about witches. It's about time! The story line is original, and that is refreshing. It isn't the same old thing. I liked Jewel and Roman very much. They have different powers and their characters are likeable. There are also some swoon worthy moments. You know I love me some romance! I'm such a romance junkee. I like Roman, but I don't think we got to know him well enough before the romance started happening. It just was there. Because we don't get to know him there were several moments that I wasn't sure if I could trust him or not. Jewel and Roman became romantic too fast. Way to fast. I felt like we missed out on all those special moments that bring a couple together. They just started making out before they knew anything about each other. I also had a problem with the fact that I'd be in the middle of reading an action sequence and then...BAM! They stop everything to make out. But they are still in imminent danger. Don't get me wrong the romance scene's were swoon worthy, but they felt ill timed. Get through the action and then let's make out. Not literally in the middle. Jewel was also on her death bed at one point but she was thinking about how hot Roman looked. I'm not sure that was realistic. Felt very...cheesy. Jewel was also kissing more than one boy and I wanted to take her aside and tell her nobody's going to want to buy the ice cream truck if she's giving out the popsicle's for free. Lots of kissing without actually knowing the boys she was kissing. I wasn't enjoying the conversations with the Russians. They didn't seem to flow and felt a bit cheesy. But, I liked the original plot line. Kept moving fast and it was interesting. 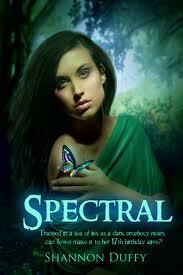 If you like witch books or you are looking for something fresh and new, then you should try Spectral! You have to let me know what you think! Shannon Duffy writes young adult and middle grade fiction. She grew up on the beautiful east coast of Canada and now lives in Ontario, Canada. She is the mom of one boy, Gabriel, her angel. She loves writing, reading, working out, soccer, and the sport of champions-shopping. She is the author of the young adult paranormal romance, SPECTRAL. Her upcoming middle grade fantasy novel, GABRIEL STONE AND THE DIVINITY OF VALTA is scheduled for a January 2013 release. Mary, thanks for the review. I'm glad that "Spectral" is one of your favorite covers for 2012 and that you thought Shannon's story was fresh and original. Elin, I hope you get a chance to check it out. It's only $2.99 on Kindle.